Who can use this Facilities Management Agreement? What is this Facilities Management Agreement for? The contract is suitable for a range of services from property management and maintenance to cleaning services and for schools, hospitals, and a wide range of public or private buildings and services. While written from the Service Provider’s point of view, it is a fairly balanced contract and should be acceptable to any reasonable client in the private or public sector. Facilities management (FM) agreements can be quite complex as they tend to cover a wide range of activities over a long term. So you need to identify the services carefully, dividing these between routine and special services. There may be purchase order forms to be issued by the client for some services. Fees and payment can again be relatively complex with a fixed annual or monthly rate for basic services and then daily rates for specified activities. Reimbursable expenses also need to be identified. The agreement should set out the agreed standard of services as well as deal with the qualifications and capacity of personnel. The client will want the right to inspect services and the service provider will need to report regularly in an agreed format. The service provider will want a reasonable limit on liability. Since disputes can arise, the agreement can usefully include a variety of different dispute resolution mechanisms including mediation. The FM agreement needs to have a clause dealing with termination as well as the consequences of termination which can be quite complicated as in many cases a lot of harm could be caused if services come to an abrupt stop. Our facilities management agreement has a short one-page contract with a detailed set of terms and conditions plus schedules. Four Schedules are also included, in order to detail description of services, contract price and fees, representatives and addresses, insurance and a form of purchase order. Contract Author – Giles Dixon, an English solicitor, with substantial experience of drafting and negotiating commercial contracts. 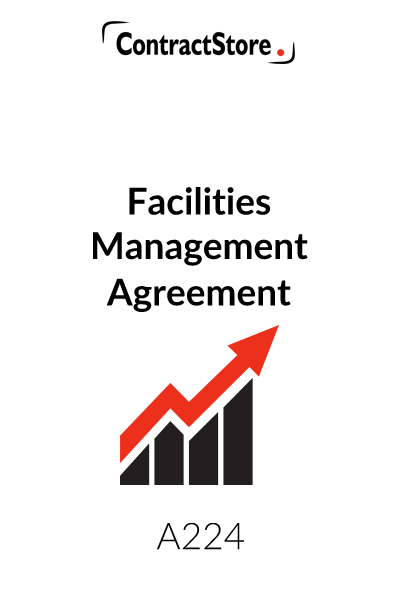 This document is a comprehensive agreement covering facilities management services. While written from the Service Provider’s point of view it is fairly balanced and covers the main issues that a client would want to see in such a contract. The agreement is made up of three separate documents – a Form of Agreement, Terms & Conditions and a number of Schedules which contain details of the services, prices and rates, insurance details and an Order form for use when a one-off service is required. The document is designed for flexible use –the Terms & Conditions will be attached to the Form of Agreement when it is signed by the designer and client. The Terms & Conditions can also be used on their own without the Form of Agreement, and given to a potential client by the facilities manager when being asked to tender for work. The agreement is comprehensive with fairly straightforward clauses. Comments on specific clauses are dealt with below. This is the document to be signed by both parties. In addition to filling in the full names and address of each party, the fees, commencement date and duration need to be completed. Clearly, the Form of Agreement may need to be tailored to particular circumstances. When it is signed –there should be two copies, one signed by each party – the Terms & Conditions and the Schedules should be attached. The Schedules are important as they out the detailed scope of work as well as details of rates and payment terms and insurance requirements. 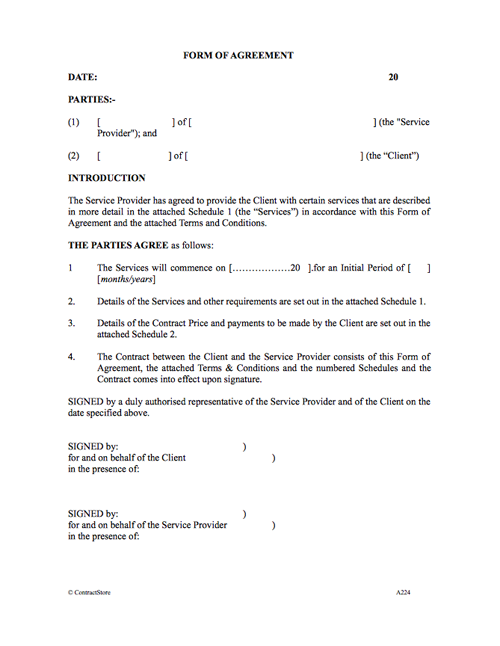 This clause contains a few defined terms which are used throughout the agreement. The services and payment are both covered here – with details set out in schedules. This briefly describes the general obligations of the Service Provider – to carry out services to the Client’s reasonable satisfaction, comply with reasonable directions, report regularly etc. 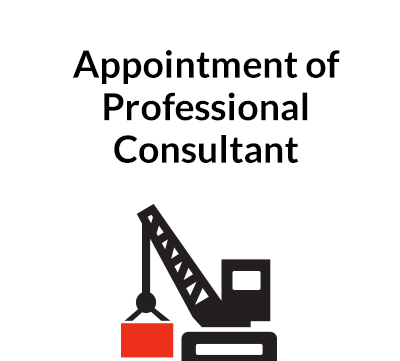 The Client will want to know that the personnel engaged on the services by the Service Provider are competent and suitably qualified and this is dealt with here. There is also provision for Criminal Record Bureau checks to be obtained when appropriate – e.g. if the services involve maintenance of school buildings when the Service Provider’s staff may come into contact with children. It is important in any project to ensure the Client provides the Service Provider with adequate access to property and equipment and that he deals promptly with requests for a decision or for information and these matters are dealt with here. A long term project needs co-operation between the parties and this clause sets up a procedure designed to achieve this – with each of the parties having dedicated representatives who meet regularly and review each other’s performance. KPI’s might be used here. There is also provision for the parties to act in good faith and in a collaborative manner. 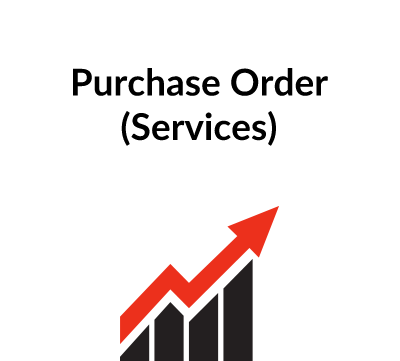 8.1 There is a procedure involving the issue of a purchase order if the Client wants to call off some extra service and a form of Purchase Order is included in a schedule. Emergency work is also dealt with in this clause. 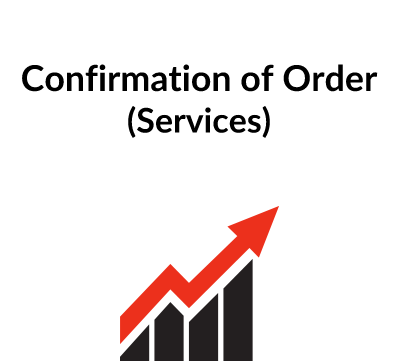 There is a procedure set out here for changes to the services requested by the Client: the Service Provider gives an estimate and agreement is needed before any extra services are started. Also in this clause the Service Provider may request extra time or money if he encounters problems that are caused by the Client or that are not reasonably foreseeable. This clause sets out a simple procedure for reporting to the Client and for dealing with handover of any specially ordered services as well as reporting any incidents that may affect the services. The details are to be set out in a schedule. The Agreement contemplates a fixed monthly fee for routine services with any other services that are ordered by the Client being paid for by reference to hourly or daily rates that are also to be set out in a schedule. Payment will be monthly in arrears and the Service Provider is entitled to claim interest on late payment. There is provision for an annual adjustment in the rates and prices – by reference to an index such as the Retail Price Index. The Service Provider gives a warranty to exercise reasonable skill and care and to see the services meet the reasonable requirements of the Client. The Client is given the right to suspend the services in certain circumstances and the clause deals with the Service Provider’s right to claim costs during the suspension period. If either party becomes insolvent or commits a material breach of the agreement then the other party has the right to terminate the Agreement. The clause also deals with hand-over to another contractor. Each party retains ownership of its own designs and documents and gives the other a licence to use them in connection with the services. A facilities management contract does not usually involve much by way of design so a short clause such as this ought to be adequate. The insurance obligations of each party are mentioned here, but details are to be set out in a schedule. Public liability, Employers liability will invariably be needed by the Service Provider and Professional Indemnity Insurance may also be required. The Client may also have insurance obligations with respect to his buildings and other property. This is an important clause to protect the Service Provider from unlimited risk of claims. This clause limits his overall liability to an amount equal to the contract price in each year with a specified amount as well. Neither party is liable for the other’s indirect and consequential losses. Both parties are subject to non-disclosure obligations with regard to confidential information they receive and the Service Provider has to clear any press release with the Client. This Clause prevents assignment without the other party’s consent, but it allows the Service Provider to subcontract any of the services. There is a progressive system of dealing with disputes – direct negotiation, mediation and then the courts. There is also provision for adjudication if this is preferred or for use where the services are covered by the ‘Construction Act’ in the UK which gives a party to a contract involving construction services the right to have a dispute referred to a short term adjudication process before it can go to the courts or arbitration. For more on mediation see our free document Z140. For information on CEDR, look at their website – www.cedr.co.uk. It is usual to have a clause such as this, stating that notices must be given in writing and specifying the method of giving notice – in this case by hand, by fax or by post. The final clause contains three paragraphs with what lawyers call ‘boiler plate’ provisions – i.e. some standard wording designed to tidy up the agreement.